Druids are the priests of the wild. They draw their power directly from the primal spirits of nature, rather than from the gods. It is neither arcane or divine, and commonly thought of as "wild". Those who become druids do so because they wish to feel rooted in time and their ancestry, to feel a connection between the life-giving earth and the sky watching over it. The druids draw their wisdom from their ancient ancestry much like how a tree draws its nutrients through its roots in the earth. A cornerstone of druids is their relationship with Acadia, the realm of the dead. As it can bring great harm, they personally shun the use of metal. Some druids are known to spend their lives peacefully in holy groves, forests or burial sites that keep them near it. They are fond of stone circles, crystals, trees, and revere nature. There is no sacred book or scripture on druid principles. Druids simply believe in the principle of energy flow, much like the monks, where one's good or bad deeds will cause that energy to return. 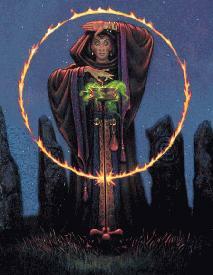 Consequently, druids always walk closely to the neutral path - either in alignment or ethos, or both. Although some choose to fight for their own reasons, druids are tolerant of religious diversity. Strength 21 None. Infravision. Resist Magic. Intelligence 17 100% Berserk. Resist Poison. Dwarf druid has a compounded experience cost of 625. Intelligence 18 100% Berserk. Resist Poison. Duergar druid has a compounded experience cost of 625. Strength 18 None. Infravision. Vuln Bash. Gnome druid has a compounded experience cost of 500. Strength 19 None. Able to Fly. Vuln Disease. Avian druid has a compounded experience cost of 650. Strength 20 None. Transform. None. Werebeast druid has a compounded experience cost of 600. Strength 22 None. Large size allows wearing oversized weapons in one hand. Resist Cold. Intelligence 21 Unique metabolism. Resist Weapon. Treant druid has a compounded experience cost of 700. Use fly scrolls and protective shield to prevent your shaman being pinned down with bash and trip, unable to cast his spells. Savebreak equipment can help lower the spell resistances of opponents. Weapon ward protects from many skills and combat style/weapon style inferiority. Focus on improving DAMROLL and SAVE VS MENTAL. His damage comes mostly from weapons, and he needs sanctuary up to complete his defences.